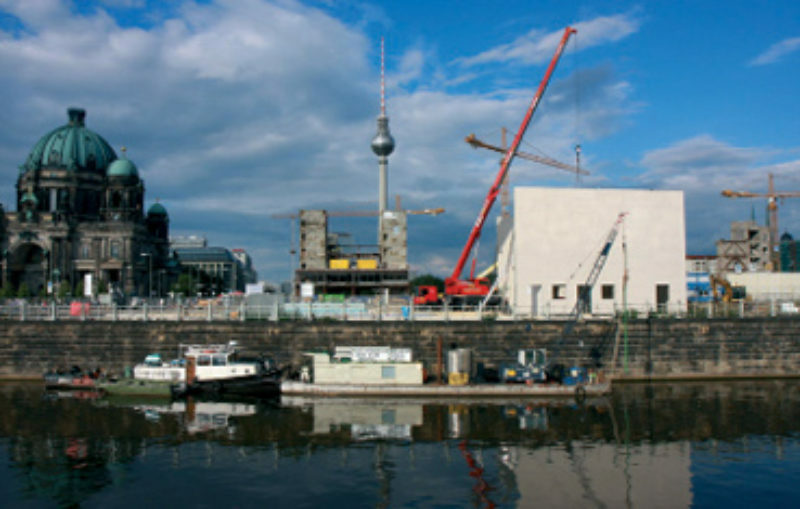 “Initial ideas for Temporäre Kunsthalle Berlin came from a white cube installation in the Palast der Republik. The two initiators of the Temporäre Kunsthalle Berlin, Coco Kühn and Constanze Kleiner, thought it was a great location. They organised a show there that lasted a few days, but it was so successful everyone started talking about Berlin needing a Kunsthalle. The last one in Berlin closed more than ten years ago; all of a sudden there was call for a new one, so they ran with the idea to build one on Schlossplatz. The art magazine ‘monopol’ presented a proposal for a different Kunsthalle, calling it ‘Cloud’, which is a reference to a Berlin song from the 1920s. But Constanze and Coco found a patron, Dieter Rosenkranz, founder of the Stiftung Zukunft Berlin, who made a pledge of one million euros to construct the building. Once they had his commitment the deal was made. The site is at the heart of Berlin. Imagine what that means… Germany values freedom for the arts, so it’s highly symbolic. It puts a very different focus on what we do here and that’s the way we are going to frame the exhibition programme over the next two years. We opened with an exhibition by Candice Breitz, with a new work opening in a few weeks; a portrait of Jack Nicholson. On the exterior we have artist Gerwald Rockenschaub’s facade. We are the only Kunsthalle that I know of that has an interior and exterior space. That came from discussions with the architect Adolf Krischanitz on the history of the white cube. Rockenschaub who was part of the planning at this stage said, why don’t we put a cloud on the outside—what we have is a pictogram of a cloud, a gentle gesture to the competitors. But it also explores how we visually communicate these days.